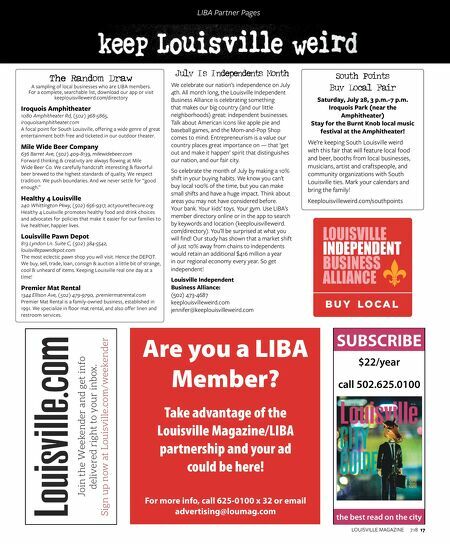 keeplouisvilleweird.com 16 LOUISVILLE MAGAZINE 7.18 LIBA Partner Pages questoutdoors.com Whether it's outdoor chic or serious climbing gear you're looking for, Quest Outdoors offers a palatial 30,000 square feet of possibilities to explore. "Our women's business is really strong," says Ryan King, owner of Quest Outdoors in St. Matthews. "Climbing and travel are huge. Our footwear section is probably our biggest driver of sales. Backpacks and camping. This is what sets us apart from other outdoor stores – we have all of this plus we're a gear store. And we've got the best fly fishing shop in Louisville." Quest has mastered the retail intersection of high-quality technical gear and fashionable boutique clothing. Organic cotton dresses and hip but durable bags rub shoulders with water purification systems, lanterns and ropes. Quest also has a beautiful selection of swimwear and travel clothing. "Women are our No. 1 shoppers," King says. High-end brands like Patagonia, Osprey, Barbor, Marmot, Prana, Kuhl and Chaco are some of the most popular sellers. In all, Quest carries more than 400 brands of clothing and gear. It isn't just a vast selection of merchandise that sets Quest apart from other stores, King says, but also a knowledgeable and adventurous staff. 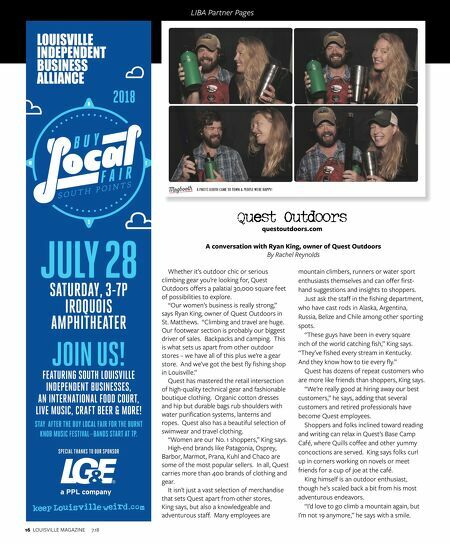 Many employees are A conversation with Ryan King, owner of Quest Outdoors By Rachel Reynolds mountain climbers, runners or water sport enthusiasts themselves and can offer first- hand suggestions and insights to shoppers. Just ask the staff in the fishing department, who have cast rods in Alaska, Argentina, Russia, Belize and Chile among other sporting spots. "These guys have been in every square inch of the world catching fish," King says. "They've fished every stream in Kentucky. And they know how to tie every fly." Quest has dozens of repeat customers who are more like friends than shoppers, King says. "We're really good at hiring away our best customers," he says, adding that several customers and retired professionals have become Quest employees. Shoppers and folks inclined toward reading and writing can relax in Quest's Base Camp Café, where Quills coffee and other yummy concoctions are served. King says folks curl up in corners working on novels or meet friends for a cup of joe at the café. King himself is an outdoor enthusiast, though he's scaled back a bit from his most adventurous endeavors. "I'd love to go climb a mountain again, but I'm not 19 anymore," he says with a smile.